The FAA lost contact with a Cessna 421 shortly before 9AM this morning. The pilot, it turns out, was unconscious, and the plane ultimately slammed into the Gulf of Mexico 135 miles off the coast of Florida. The pilot has been identified as Dr. Peter Hertzak. The plane departed, as planned, at 6:43 AM CT. It gained altitude and speed fairly regularly until the FAA mysteriously lost contact with the pilot. Luckily, the plane didn't ever veer off towards land, and it merely followed an loopy, circling path. In the image above from Flight Aware, you can see an FAA controller's worst nightmare. Planned flight: 485 miles. Actual flight: 1225 miles. Here's the flight's average speed and altitude, courtesy of Flight Aware. The plane takes off as it should, and then everything goes crazy. It maintains the same altitude for the duration of the flight until it plummets into the Gulf of Mexico. As you see in the image above, the circling path causes the variation in speed after the pilot loses consciousness. When the plane hits a headwind, the speed goes down; when the plane has the wind at its tail, it goes up. Nobody knows why exactly the pilot was unconscious on what should have been a routine private plane flight from Slidell, Louisiana to Sarasota, Florida. As the FAA followed the plane's trajectory with from the ground the plane was tracked by F15s 27,000 feet in the air. The F15s reported that the windows of the plane were fogged over, which might indicate that the plane lost pressurization, which would have knocked the pilot out in seconds. According to Flight Aware the plane was registered to Lee H Aviation in Wilmington, Delaware. The plane had a tail number of N48DL. Here are images of the actual plane. Thanks to Daniel Compton and Airport-Data.com for the photos. It's unclear if anybody besides the unconscious pilot was onboard the plane, but the Coast Guard is currently conducting a search and rescue operation of the area hoping to find any survivors. The Coast Guard also put out an alert to other boats in the area. A NORAD official confirmed to ABC News that two F-15 jets made contact with the plane on Thursday morning and have been monitoring it ever since as it flies aimlessly over the Gulf. We'll keep updating as we learn more. Below are our updates from when the story was developing. According to NORAD, they expect the plane to crash in about 10 minutes, at 12:30. That image above courtesy of Flight Aware shows the plane's trajectory. According to NBC FW, the plane is far away from land and will plunge into the water. There's no word on why the pilot is unconscious. The plane should be down by now. 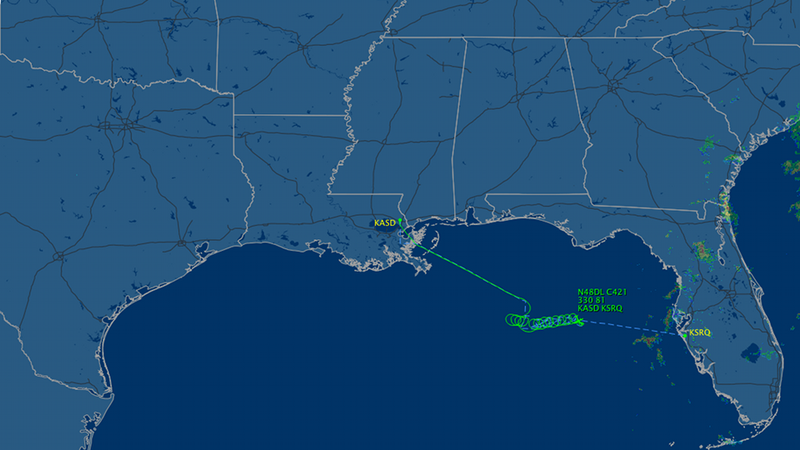 According to Fox News' Peter Doocy on Twitter: "NORAD wouldnt answer Q's about whether or not they will take down unresponsive plane if it threatens civilian areas, but they are monitoring"
The FAA says it lost radio contact with a Cessna 421 en route from Slidell, La., to Sarasota, Fl., shortly before 9am eastern this morning. The pilot was the only person on board the plane.